Amber will be speaking at the Sacramento Growth Conference on February 15, 2019. 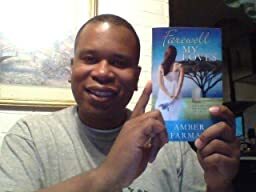 I have to say that FAREWELL MY LOVES by author Amber Farman is nothing like I expected. In fact, I would say it is better. She is able to take you into these characters that are so well developed and so US—that the reader can’t help but to put themselves in the various situations, feeling what they feel and having to consider what they would do in each circumstance. Meredith Matthews is the principal character initially, and the authors allows us to see how her life unfolded after some devestating news. Along the journey is her family and her desire to make sure they are cared for, but when Clare enters the picture no one could have expected what happens next. This book is all about living life and being able to love life, even when it takes us down a path we weren’t expecting. It is also about trusting yourself to do what is right, even when you’re not entirely sure what that might be. If you are looking for a book that is sure to push you out of your comfort zone and engage you along the way then FAREWELL MY LOVES is for you.